We are manufacturing Air Bellow. - ready stock, immediate delivery. We deal in best quality of Air Spring and we offer them to our clients all over the world.We render our clients with a broad range of Air Bellows / Air Springs, which finds application in short stroke and high-force applications. It is easy to install and known for its durability, high strength & optimum quality. Our range of Air Bellow / Air Spring is widely used in automotive industry. Owing to highly advanced infrastructural setup, we are engrossed in offering a precision-engineered assortment of Tata Air Spring Bellow. Our offered product is designed at state-of-art production unit. With the aid of our technologically advanced production unit, we are able to offer Auto Guide Air Bellow at economical prices. We offer the most amazing and advanced range of Air bellows. It is a device constructed to furnish a strong blast of air. The simplest type consists essentially of a flexible bag comprising a pair of rigid boards with handles joined by flexible leather sides enclosing an approximately airtight cavity. Our products use the best raw material and known for a strength and durability. 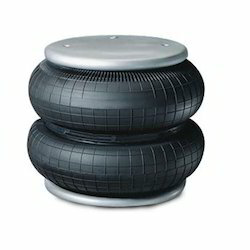 We are leading manufacturer and supplier of Bellows for Air Handling Bellows in India. We have supplied these bellows to various government, semi goverment and private companies throughout India.We have supplied these bellows for very high pressure application also. Krishna Bellow & Hose Mfg Co.
We render our clients with a broad range of Air Bellows / Air Springs, which finds application in short stroke and high-force applications. It is easy to install and known for its durability, high strength & optimum quality. 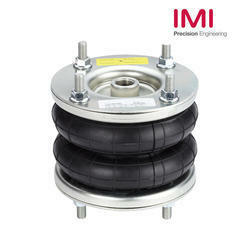 Our range of Air Bellow / Air Spring is widely used in automotive industry. - 6 to 26 inch. - No maintenance or lubrication.